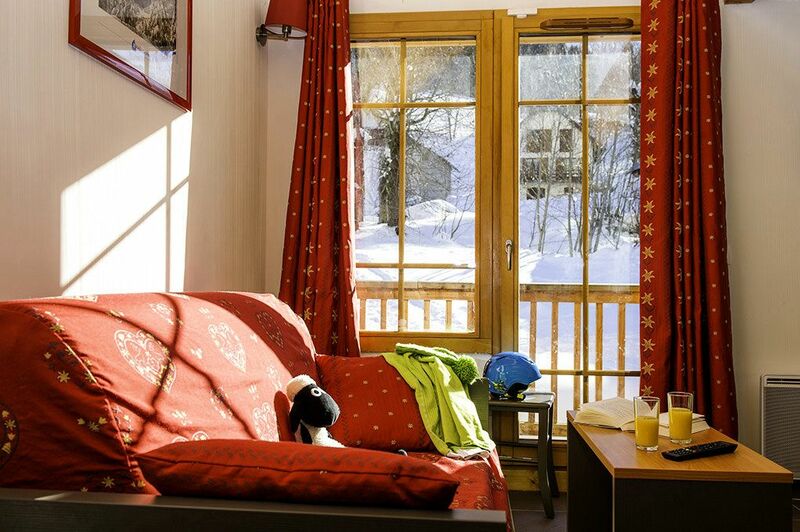 The residence Les Chalets de Belledonne is ideally located in the resort of Saint Colomban des Villards, in the heart of the Glandon Valley, close to shops (grocery, brewery, restaurant). It consists of 13 chalets divided into 4 dwellings each. For your well-being, you can enjoy a semi indoor / heated swimming pool, sauna (extra charge) and a bread deposit. The residence also offers free WiFi access at the reception or in your accommodation with supplement and a free outdoor parking (one place per accommodation). 2 Room Cabin 5 People of 40m2 & nbsp; approximately composed of a living room with a sofa bed BZ 2 beds, a room with 2 single beds, a corner cabin with window with 1 single bed, a kitchenette, a bathroom and WC separated. The apartment includes an equipped kitchenette with a dishwasher, 4-burner ceramic hob, extractor hood, fridge, microwave grill, toaster, coffee maker and electric kettle. It also has a towel dryer in the bathroom. TV is included and bed linen is provided. Pets allowed: 30 € per week, 5 € / day or 90 € for 3 weeks and more (only 1 pet per accommodation). To report when booking. Anti-rabies certificate compulsory. First- and second-class attack dogs are strictly forbidden in our residences. Final cleaning: End of stay cleaning (except kitchenette): If your apartment is not cleaned, a cleaning will be charged. Indoor parking: 40 € / week or 28 € in case of pre-booking. Limited places. To pre-book imperatively. Pets Allowed: 39 € / week, 7 € / night - To be paid on site and specify when booking - Only one pet per accommodation. They should not be left alone in the absence of their masters who are civilly responsible and must be kept on a leash. Admitted upon presentation of the animal's passport, current vaccination booklet and tattoo. Dogs of 1st and 2nd categories are prohibited. Deposit: 250 € / accomodation - To be paid on site - Will be refunded the day of departure or by mail within 8 days in case of departure outside opening hours, after deduction of any costs of restoration of the premises and / or the value of missing or damaged equipment. Beds made on arrival: € 10.50 / bed (including sheets and pillowcases). To pre-book and pay locally. Indoor parking: 28 € to be paid on site (if pre-booked at the same time as the accommodation and subject to availability) or 40 € / week (to be paid on site) - Underground parking to pre-book imperatively before arrival because number of limited places. - 600 km from Paris. - Highway A43 exit N ° 26 + 927 D.
or N + 6 D. 927 towards Col du Glandon - (St Colomban is 10 km from St Etienne de Cuines). - Summer: access from Grenoble Valley Water of Olle and the Col du Glandon.